Political Arithmetik: Congressional Approval at 10 Year Low? The LATimes/Bloomberg poll, taken 6/7-10/07 finds approval of Congress at 27%, disapproval at 65%. That's a bit below my current trend estimate of 31.1%, but not a statistical outlier. WASHINGTON — Fueled by disappointment at the pace of change since Democrats assumed the majority on Capitol Hill, public approval of Congress has fallen to its lowest level in more than a decade, according to a new Los Angeles Times/Bloomberg poll. Just 27% of Americans now approve of the way Congress is doing its job, the poll found, down from 36% in January, when Democrats assumed control of the House and the Senate. My problem with this story is a common one. What it says is exactly true, but it ignores all polling not conducted by the LATimes and Bloomberg. This IS the lowest LA Times Poll reading of Congressional approval in a decade. 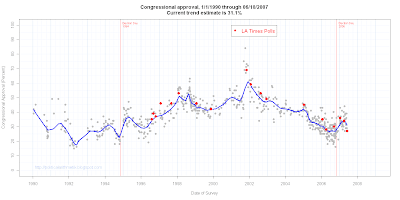 As the graph above shows, the LA Times polls have been generally consistent with the overall trend in Congressional approval since 1996, the earliest data I have for the LA Times polls. Their polls track well with the ups and downs of Congressional approval during this time. The "house effect", the average difference between the LA Times and the estimated trend is a moderate +2.6, meaning the LATimes approval is usually a bit above the overall trend estimate. More important the correlation of the LATimes poll and my trend estimate is a robust +.96, showing a very strong relationship between their polls and the trend. This is just what we'd expect from an excellent poll, one that is conducted to high standards of polling methodology. That is a reputation the LA Times has justly earned. So I repeat that nothing here is evidence of a fault with the individual poll or the LATimes polling more generally. Quite the opposite. Nor is the basic conclusion that approval of congress is going down in question. My trend estimate turned down starting April 15, and so far there is no evidence that the decline has slowed, let alone reversed. But we come back to the need for comparison to put the poll in the context of what else we know about Congressional approval. The LA Times understandably wants to compare their polling over time and to gain value from their expensive polling. I'm all for that. But the story chooses to ignore, even for a sentence, the fact that there is a lot of polling that has been done on this subject, and that a significant amount of that polling does not support the "lowest in a decade" conclusion. Contrast this treatment with that in USAToday last week when the USAToday/Gallup poll produced a result showing Obama with a slight lead over Clinton. USAToday wrote the story, discussed the meaning of the result, but also acknowledged in the story that there was other polling that did not show this sharp narrowing of the Obama-Clinton gap. I think the result was a very responsible treatment of the poll, still showing the value of conducting proprietary polls yet not writing as if other polls did not exist. If we choose to pay attention to all the polling, as my trend estimate does, then we would conclude that approval of Congress remained within a half a point of 27% from June through October of 2006. This was the low point of the decade for the trend, and in fact since the Republicans gained control in November 1994. The Democratic Congress fell below 27% just before the 1994 election and again earlier in 1992. No other Congress has had a trend estimate this low since 1990 when my data begin. Following the Democratic takeover of Congress in January, the approval trend rose to a high of 34.4% on April 15 and has since declined to 31.1% (which includes the current LATimes/Bloomberg data in the estimate.) Based on this, the gain was about 7 points, of which about 3 points have since been given up. Net, the current Congress is still about 4 points above the lows of 2006. It is hard to sustain a claim that this is the lowest approval in a decade, unless one focuses only on the "in-house" polls. But it is very easy to see, with support from all those other polls, that approval has started to decline and that this poses risks for the Democrats in Congress. The LATimes/Bloomberg poll does a good job showing that decline since January and explores the reasons for the decline, especially among liberal Democrats. All of that is excellent reporting and use of a poll, showing the strengths of original data collection and analysis. I wish editors and reporters would acknowledge that they do not exist alone. When they ignore abundant outside polling, they undercut the very credibility of their own polling as well as serve their readers poorly by creating headlines which are only true within a very limited context. This story could have correctly informed readers AND exhibited the strengths of the LATimes polling operation if it had just stayed away from the "lowest in a decade" and focused instead on the dangers to Democrats of losing their base. Instead a headline is now being repeated which is quite misleading in light of all polling on Congress.